This Haier 1.5 Ton DC Inverter AC HSU-18HFAA is capable of heating and cooling function with its 18000 BTU capacity. 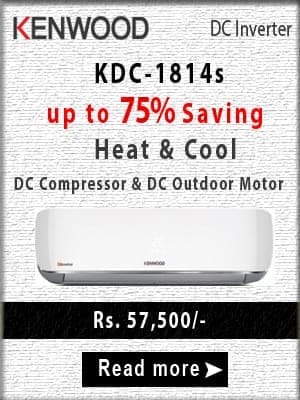 This 1.5 Ton air conditioner is equipped with DC inverter technology and gives you the best savings in the electricity bills. You can also use this product with UPS, Solar panels and generators. It consumes 320 to 1680 watts of electricity and available in white, gold, and black color with price in Pakistan is Rs. 72000. The inerter air conditioner comes with 3 Years compressor and 1 year parts warranty. The remote control of air conditioner consists of all functions to control the functionality of this electrical equipment Some of its main settings are Sleep, Swing, Temp control, Fan speed, Mode, Self clean, Timer etc. Package Included Indoor unit, Outdoor unit, Indoor Back Plate, Remote, Pipe, User Manual. Disclaimer: Dear visitors, We did our best but we cannot guarantee that the Specs/Price on this page is 100% correct (Human error is possible). For correct info. always visit the nearest local shop.